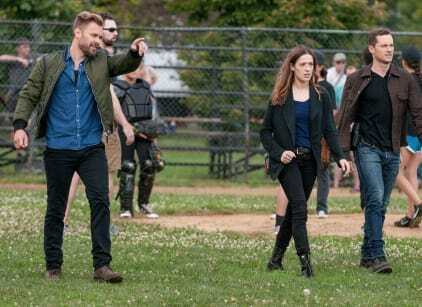 We can all agree that Chicago PD Season 6 Episode 3 kicked off with a surprising new "friends with benefits" couple: Ruzek and Upton. Things seemed to heat up after Ruzek took Upton out for a drink after she became emotional about Jay nearly dying while trying to avenge his father's death. Upton assured him that she wanted to keep things "low-key," and Ruzek said he would honor her wishes. By the end of their shift, the two returned to her place to do "that thing that they said they weren't going to do again." The case-of-the-week involved a murder at a popular taco joint in the city. The shooters kidnapped one of the restaurant's patrons, a foodie blogger and the daughter of a wealthy and vocal police critic in the city. As Intelligence tried to locate the girl, he put up posters promising a $500,000 reward which only made things more difficult in weeding out the truth. One sanitation worker witnessed the girl running out of a car and being chased into a warehouse. Intelligence followed the tip and found the girl badly injured. Her father publicly thanked the sanitation worker on Twitter which led to his body being found shortly after. The girl repeatedly told Voight that she could not I.D the man, however, they were still able to pinpoint that Jorge was involved. When Jorge refused to snitch on his friend, Intelligence decided to release him with the hopes that he'd lead them right to Pablo. Jorge fell for it, however, he also shot and killed Pablo. A police chase ensued, but they weren't able to catch up to him after he stole a car. A deeper web investigation revealed that the girl and Jorge were in a relationship. Jorge killed Pablo as retaliation after finding out that Pablo tried to kill her. Voight promises her father, Gilchrest, that he won't press charges against her if she helps them nail down Jorge. They agree, but as he's about to meet up with her, he sways her with apologies and love confessions. She warns him that it's a trap, but police eventually get to him. Voight tells Gilchrest the deal to protect his little girl is off because she didn't deliver on the promise. However, the new First Deputy Brennan is so desperate for a good public appearance, she swaps the girls freedom for a public endorsement from Gilchrest. Seeing that there is still a power game at play, Voight says he too wants something in return. He presents Platt with an exoneration letter for Al which guarantees that his wife will be paid out the rest of his pension. "To Al," they both say somberly as they raise a glass in his name. Ruzek: How do you want to play this? 500 grand has a way of making people remember things they've never seen. Permalink: 500 grand has a way of making people remember things they've never seen.